Having a wider face has been linked with higher levels of attraction and aggression, and now research has suggested it may also be a sign of psychopathy. 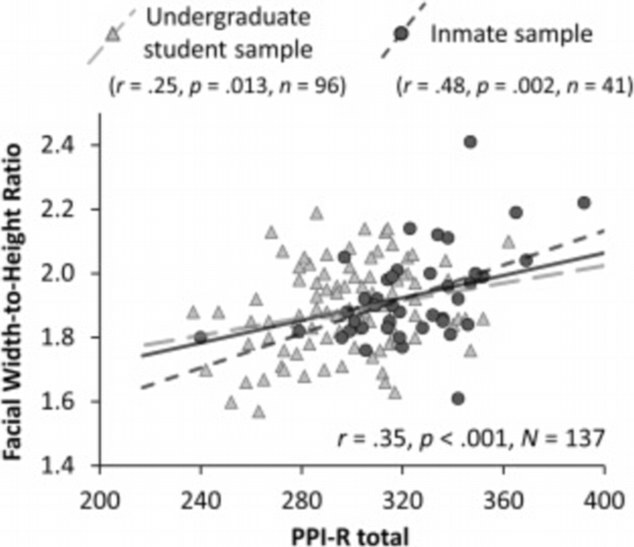 A study of students and prison inmates found that men with a higher facial width-to-height ratio were more likely to exhibit what’s known as ‘self-centred impulsivity’. They also showed signs of ‘fearless dominance’ as well as a tendency to blame other people for problems. Those high in self-centred impulsivity also tend to neglect the social norms and regulations that the rest of us live by. Fearless dominance, meanwhile, includes a tendency to embrace risk without any fear, showing limited reaction to awful events that would make the rest of us panic – combined with a tendency to appear charming and influential. Although this study finds a correlation, the researchers stress that it doesn’t mean all men with wide faces have psychopathic tendencies. 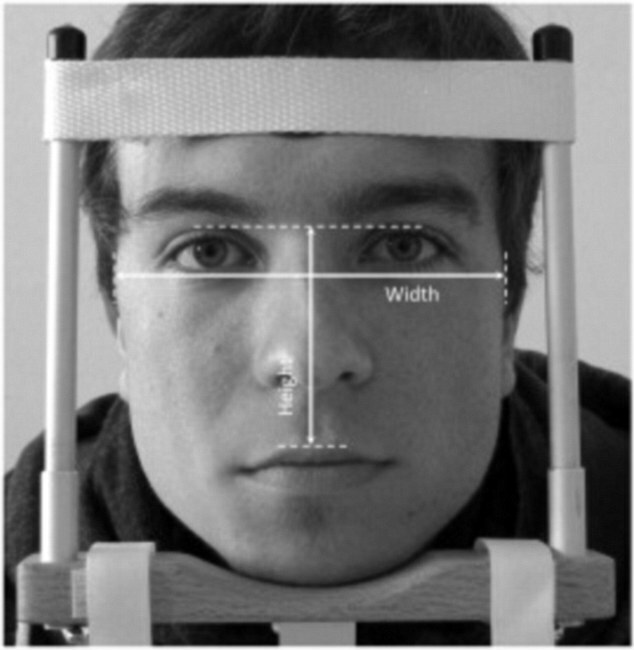 The facial width to height ratio (fWHR) is worked out by measuring the horizontal distance between the outer edges of the cheekbones and the vertical distance from the highest point of the top lip to the highest point of the eyelids. The width is then divided by the height. For the study, the researchers asked 96 adult male university students and 41 male prisoners at a young offenders institution to complete a standard questionnaire that psychologists use to measure psychopathic traits. Known as the Psychopathic Personality Inventory-Revised (PPI-R) test, it creates a total psychopathy score (PPI-R total) and studies fearless dominance, self-centered impulsivity, and coldheartedness. Following the questionnaire, the men were asked to sit with their faces on a chin-rest, while their photographs were taken. The researchers measured the men’s fWHRs from these photos and correlated the results with their questionnaire answers. Face width in men is affected by testosterone exposure during puberty, with wider faces reflecting higher levels of testosterone, the researchers from the Johann Wolfgang Goethe University in Frankfurt said. ‘Without doubt, testosterone has long-lasting effects on the brain, particularly during sensitive developmental periods such as puberty,’ they wrote in the journal Personality and Individual Differences. ‘The affected brain regions include the amygdala and the hippocampus, limbic structures that are crucially involved in socio-emotional behaviour. Previous studies have found that women are more likely to want a man with a wide face for a fling, but less likely to see him as husband material, while wide-faced footballers score more goals but commit more fouls. Last year, a separate study found both men and women with wide faces tend to be more aggressive, dominant and angry. Those with broad features – such as Wayne Rooney, Sylvester Stallone or Sarah Palin – are more likely to have bad tempers and display bouts of verbal or physical aggression. Psychologists think the trait is linked to the evolutionary benefit of having thick cheekbones. Those who had more robust facial bones could be more aggressive, because they could better withstand a punch, the scientists suggest. Does this have a racial application? Appearing Happy Can Make You Look More Trustworthy – And A Wider Face Can Make You Seem Competent Scientists Claim Phrenology Is Not A Valid Science. Now, In 2017, A Computer Application Used To Diagnose Genetic Diseases From Facial Pictures Proves That The Basic Principles Of Phrenology Are Correct.